Rebel Wilson Goes Red Hot for Dinner in WeHo! Rebel Wilson is all smiles as she arrives at dinner at Craig’s restaurant on Tuesday night (October 23) in West Hollywood, Calif. The 38-year-old Pitch Perfect star looked so chic in a red dress as she met up with a few friends for a night out on the town. The night before, Rebel stepped out in style for the 2018 InStyle Awards in Los Angeles. Before hitting the red carpet, Rebel took to Instagram to share a photo of herself – teasing her big plans for after the event! “#LA #sunset #InstyleAwards #Givenchy #innoutburgerin6hours,” Rebel wrote. FYI: Kaley is wearing Kate Spade. Lea is wearing David Koma with Brian Atwood shoes and Jennifer Fisher hoop earrings. Angela is wearing a Rhea Costa dress. Rebel is wearing Givenchy. 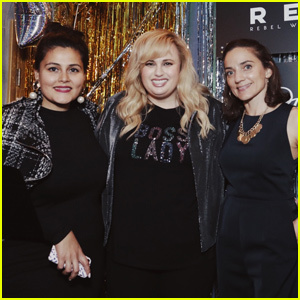 Rebel Wilson Celebrates Her 'Dia & Co' Holiday Collection! Rebel Wilson is kicking off the holiday season a little early! The 38-year-old actress celebrated the launch of the Rebel Wilson x Angels holiday collection on Thursday (October 11) at at Sid Gold’s Request Room in New York City. The plus size line features 34 looks, including tops, bottoms, jackets, and dresses. “Thanks to @diaandco we had a very intimate party tonight in NYC to celebrate the upcoming Holiday Collection for @rebelwilsonxangels ! The theme for the holiday collection is POWER DRESSING: as in EMPOWERMENT! Much love to all my plus size angels who came out and supported!! ❤️,” Rebel wrote on her Instagram. To see all the pieces in Rebel‘s collection, visit dia.com. Mandy Moore joins Ellen Pompeo at the 2018 Veuve Clicquot Polo Classic on Saturday afternoon (October 6) at Will Rogers State Historic Park in the Pacific Palisades, Calif. The 34-year-old This Is Us actress looked pretty in a red dress and black heels while the 48-year-old Grey’s Anatomy star rocked a burgundy and black dress and white sneakers for the event. Other stars at the event included Kaley Cuoco, Jesse Williams, Angela Sarafyan, Harry Shum Jr., Samantha Ronson, Rebel Wilson, Justin Hartley, Molly Sims, Jamie Lynn Sigler, Camilla Belle, Garcelle Beauvais, and Jessica Pare. FYI: Mandy is wearing a Fendi dress and Dior shoes, with a Cafune bag from ShopBop. Kaley is wearing a Fendi outfit and Stuart Weitzman shoes while carrying a Fendi bag. Harry‘s blazer and shoes are by Vince Camuto. Ellen is wearing an A.L.C. dress. Jamie Lynn is wearing Vince Camuto shoes and a Vince Camuto tote. Molly is wearing a Warm dress. Camilla is wearing a Novis look and carrying a Ming Ray bag. Rebel Wilson Goes for a Hike in Los Feliz! Rebel Wilson is getting in a hike! The 38-year-old Pitch Perfect actress was spotted going on a hike on Sunday (August 19) in Los Feliz, Calif.
Rebel recently stepped out for the Day of Indulgence party hosted by producer Jennifer Klein in Brentwood, Calif. The star-studded roster of celebrities were treated to many luxurious treatments and high-end products. She was also recently seen shooting scenes for her upcoming rom-com Isn’t It Romantic with Liam Hemsworth and Priyanka Chopra.